I have a strange love of pirates, ever since I was a kid and watched Captain Blood. So the idea of a book of a girl pirate, my secret dream, is definitely right up my alley. 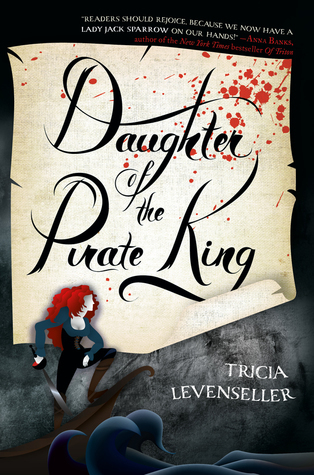 I loved the adventure and piracy of Daughter of the Pirate King. The book captures what I love best about old pirate movies. Not only are they full of adventure but also have a lot of witty dialogue. At times Alosa is quite humorous, especially when she banters with Riden. It gave the book a little bit more of a light heartedness that I enjoyed. Alosa is a spirited, fierce and quick witted. She has been trained by her father to be ruthless and tuck her emotions away. Although she doesn’t follow this all the time, she has great affection for her hand picked crew. Which predominantly consists of women. She is also very observant and she rewards kindness. She is by far a force to be reckoned. She does greatly seek her father’s approval which can sometimes dictate her actions. Alosa’s romance with Riden is a slow burn. They are adversaries, friends and then teetering on something more. Riden is loyal to his brother, through thick and thin. It’s admirable and stems from what had happened in their past. I like how he challenges Alosa in ways she did not expect and that he chooses to use his wit rather than sword to get the information he needs. I really enjoyed the plot. There were interesting aspects that you didn’t always see coming. At first you think of the world being confined to the one boat but as things unravel it because bigger than that. Like I stated earlier I love a good pirate novel and add a female pirate, you’ve got an enjoyable tale. I can’t wait to see how the story continues and if you are looking for something when a strong lead and fun adventure. I can say this is the story for you.